I won’t beat about the bush today. I don’t want to talk about stuff and nonsense when there are better things to discuss such as ‘enterprising’ budgets and how this Government’s growth and development initiatives are made of ‘star stuff’. I can’t however ignore the idiosyncratic and arguably irresponsible statements made by senior so-called statesmen about the alleged collusion of my colleagues with the legions of the demonstrably corrupt he so evidently despises but isn’t bothered enough about to bring to book. There is every possibility that some segments of the Fourth Estate are in fact in favour of the former regime. And they are probably (rather unconscionably) plotting and planning on behalf of a former president and his estate which has (rather unpredictably) fallen into a state of disrepair. But that doesn’t make them traitors. Or anti-patriots who have lost their faith in neoliberal neoconservative doctrine. Or conspirators who have lost face upon being discovered and exposed by our ever-vigilant Prime Minister and his nanny state who eavesdrops on friends and foes alike. It simply makes the scribes who are sucking up to a sacked despot sad and pathetic. And their plight simply means that they have lost the plot. No one needs require them to lose their lives – as under the previous lot. Or lose their livelihoods – as under just about every government from JR to MR who treat the journalists who won’t, don’t, can’t, kowtow to the powers that be as scoundrels to be scorned. Just let me get this off my chest (as the actress said to the bishop) and we’ll all be a happier bunch (as the bishop replied). There is no need for senior supposedly responsible political leaders to conjure the spectre of a media conspiracy to topple them when there is plainly enough going on in Government ranks to unsettle the most insensitive of senior so-called statesmen. The free media have reported rather openly and transparently on the less-than-honest (to put it mildly and kindly) goings on between the three other arms of Government for anyone to be in any doubt about how there has been a fall from erstwhile lofty pedestals occupied by pontificating patricians and pompous panjandrums. If human nature changes, I’ll eat my new political culture hat. My hat! There is nothing new under the sun. Only the smell of napalm in the morning or an editor’s blood on the high street in the afternoon is missing. So here’s our plea to you to please cease and desist from pointing fingers vaguely in our direction. 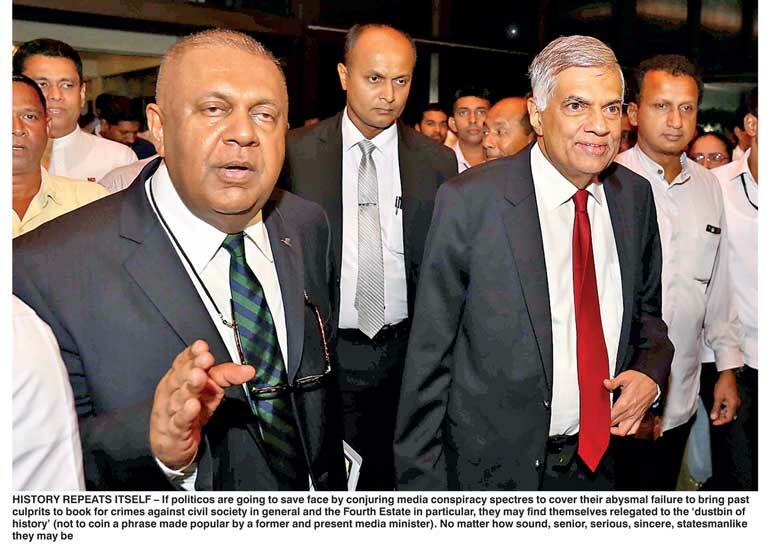 If there is anything illegal in the activities of any media house – whether head held high (Sinhala: ‘Sirasa’) thanks to Sirisena (Sinhalese: ‘Sira’) or any other low down nefarious scurrilous network online – let it be investigated openly and transparently. And if so let its less-than-honest dealings be brought into the sunlight where Sri Lanka’s politics-weary citizens like to live. And let the law follow its due process sans sanctimonious endorsements by presidents and prime ministers urging the IGP and AG to do their duty. Feel free, while you’re about it, to bring to light – to say nothing of bringing to book – all the corrupt miscreants and cynical murderers still at large from previous regimes and leftover to wreak havoc in our post-war nation struggling to become a post-conflict society. Thank you so much. 1.“The media is free today.” Write freely on how favoured you feel that a fundamental right of any halfway decent democracy is being hijacked to praise living politicos and bury half-dead ex-dictators. Discuss. Engage critically. Constructively hypothesise what a truly unfettered press and electronic station atmosphere would look like under republicans who minded affairs of state while journalists reported without undue constraints including vague allegations of conspiracy. d. Where’s the “none of these” option? 2. So, who killed Lasantha, abducted Prageeth, brutalised Keith, murdered Taraki, did the dirty by dozens of unknown unsung heroes of a missing generation of journos? 3. What does the free media still have left to do to sort out the state of affairs in its own estate? From what I can see of the free media today, the industry – for that is what this arm of civil society is: a business as much as a profession – is taking proactive steps to critique and streamline its praxis. From seminars where its members talk to themselves about censorship to self-censorship, to the championing of marginalised segments of the populace with the adroit use of technology, journalists editors writers of this country are all challenging themselves to raise the bar and set a higher standard. But the senior serious so-called statesmen won’t welcome all we have to say; don’t quite see eye-to-eye with us on democratic-republicanism because sadly too many of the supposedly statesmanlike leaders are less-than-honest; can’t see for themselves what dinosaurs they really are. But it does more than amuse – it aggravates – us when these silly straw-men (their headpiece filled with straw and their codpieces full to the brim with scams and shams) call us names. But still keep secret in private shameless places the names of those who killed boldly and brazenly in public spaces the errant editors of a not-quite-dead generation of journos. Whoever said sticks and stones may break my bones, but words will never hurt me was an idiot. Or sheltered from reality by virtue of insanity. Or utterly insensitive. Or all three. For the truth is that the word kills. And the spirit of the word kills. From history I can think of a great king but terrible ruler, Henry I of House Anjou and sovereign of England, who once mused (almost under his breath, but taking care that his loyal supporters heard well enough), “Who will rid me of this troublesome priest?” Almost immediately foul loyal nobles rode out – like some latter-day Four Horsemen of the Apocalypse – to assassinate the thorn in their monarch’s side… the martyr Thomas à Becket, Archbishop of Canterbury and occasional gadfly. From home affairs that we’ve still not quite forgotten – or forgiven – I can think of a great woman but terrible president, who shall remain nameless for the nonce (because she is still among the living, and I would like to remain there too), who once mused (hardly sotto voce, for that was not her style if you will recall the reign of our very own Marie Antoinette), “Who will rid me of these troublesome media menaces?” And almost as if at her whim and fancy, her craven hangers-on volunteered for the grim task… and even if they did not carry it out under her ancien régime (that’s French for you, madame), her successor proved up to the grisly commission. Today, the talk is all about punishing the impunity of journalist-killers. So, let the powers that be be the first to place their necks on the block before the guillotine of false accusations – or even unfair and unnecessary politically-motivated true ones – descends. Let the State – and especially the first estate of the Executive – walk the talk.